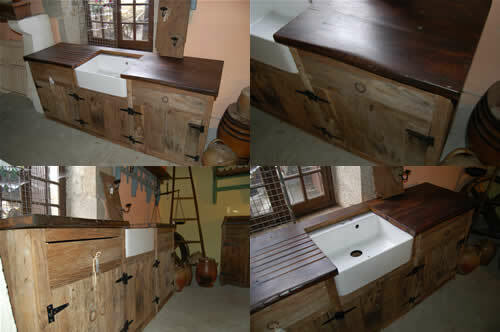 We offer a range of bespoke country furniture hand built by a registered artisan using reclaimed wood. The wood is expertly treated, which may involve de-nailing, pressure washing, drying, planing, edging, oiling, waxing amongst other things, before being crafted to make country furniture to your or our design. We carry a stock of items but are always happy to discuss your ideas and produce exactly the piece you’ve been searching for. Before coming to France David had a factory making furniture from reclaimed pine and a shop in Bath for ten years and he now brings that knowledge and experience to bear producing country furniture in France. For further information contact Terry on 05 45 30 72 04. The sink unit above is made using reclaimed doors and cattle partitions and measures approximately 2m by 900cm by 600cm and has a new sink but if you need different dimensions or have a sink you would like a unit built around feel free to contact us.